One of the options for enhancing the appearance of your teeth or smile in Park City, Salt Lake City, and Heber, Utah, is direct bonding. Direct bonding, also referred to as tooth bonding or dental bonding, can solve a variety of cosmetic problems. Direct bonding can repair stained, chipped, gapped, decayed or misaligned teeth. This is an example of a big change with relatively small procedures. The right lateral incisor has dental bonding to make it more like the shape of a real tooth. The central incisor next to it was shaped a little with a small amount of bonding added to it. 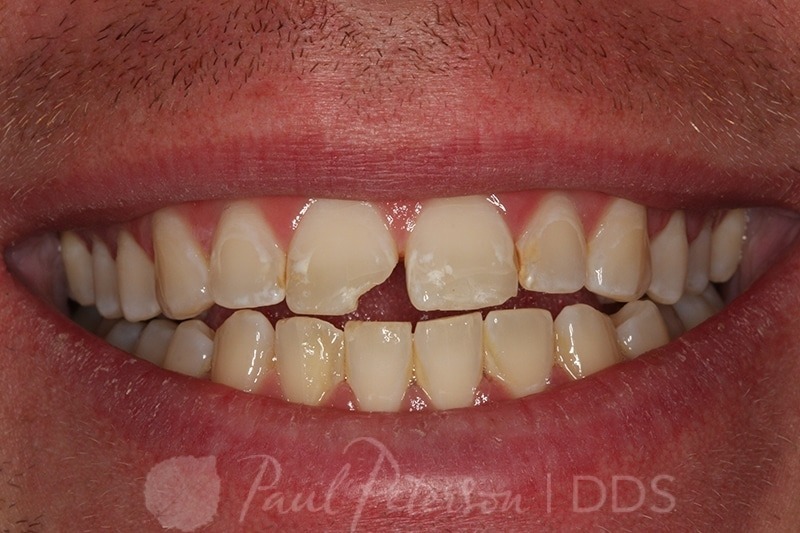 Dental bonding can be a conservative and affordable alternative to porcelain veneers and can be done in one visit. Tooth bonding is well-suited for minor cosmetic updates, temporary correction of cosmetic defects, and teeth repair in areas of very low bite pressure. It also has the advantage of being very conservative to the tooth structure and can often be done without any numbing of the teeth. Bonding involves a special resin material being applied to your teeth. This resin bonds to your teeth (that’s why it is called bonding), and hardens to become very strong and beautiful. So what are the disadvantages? A big one is that for this to look great requires an extraordinary amount of artistry and skill of the dentist. 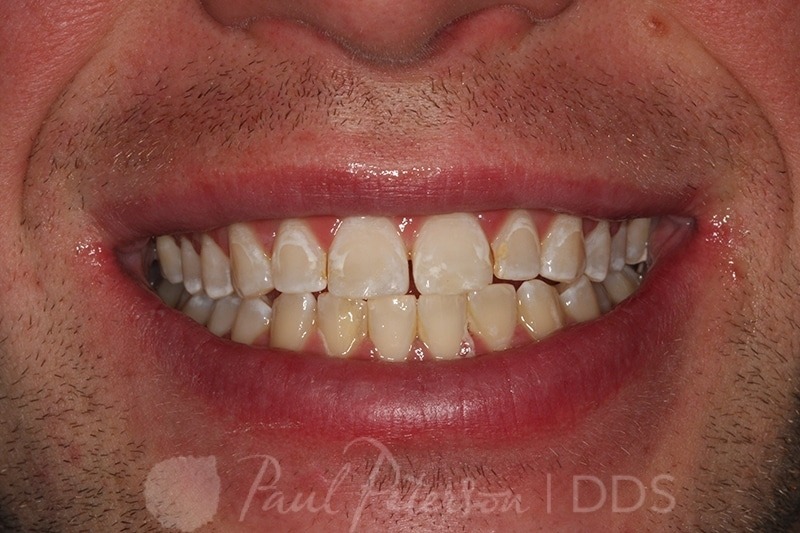 Dr. Paul Peterson has worked hard to perfect his ability to match the natural beauty and color of real teeth. Where some dentists might use one shade of composite, Dr. Paul Peterson will usually use several slightly different shades and translucencies, because that is what teeth look like. Another possible disadvantage of bonding over other options is that it does not have near the strength of tooth structure or even porcelain. There are limitations on where it can be used and the life expectancy of bonding could be a fraction of what porcelain will be. Still, if done well and in the appropriate applications, you can usually expect bonding to last many years before it will need to be replaced or repaired. 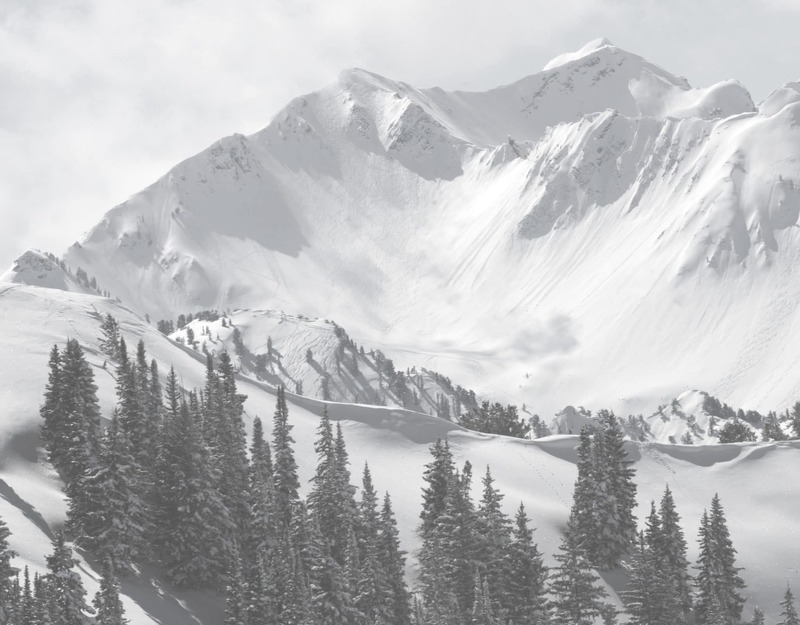 Advanced Cosmetic Dentistry proudly provides Park City, Salt Lake City, Heber, Duchesne, Vernal, UT and the surrounding areas with advanced dental bonding procedures. Call today for your consultation at (435) 658-0678 or complete a Contact Form here!